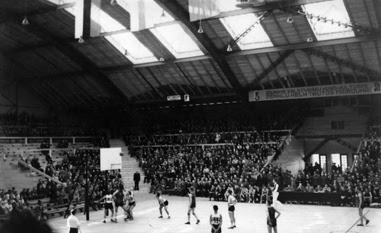 The Kaunas Sports Hall (Kauno sporto halė), above, was completed before the 3rd European Basketball Championship in 1939 (Eurobasket 1939). A prominent Lithuanian construction engineer of Jewish origin, Anatolijus Rozenbliumas, has designed the Sports Hall. My Dad was among the spectators in the hall. Below is a sample of a championship game ticket. 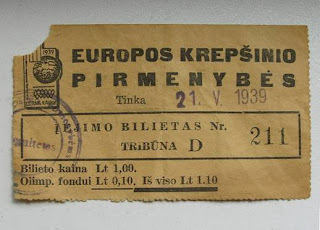 The Lithuanian national basketball team won the European Basketball Championship in 1937 (in Riga, Latvia) and in 1939 (when Lithuania was the host country). My Dad told me a lot about Pranas Lubinas (Frank John Lubin), an American-Lithuanian basketball player. Lithuania won the European Basketball Championship in 1937, using American-born players of Lithuanian heritage. When Lithuania hosted the EuroBasket in 1939, it again won the title, this time with Lubin playing and coaching. He is often called the "Grandfather or Godfather of Lithuanian basketball" (Lietuvos krepšinio Krikštatėvis). Also, Lubin had played for the gold medal United States national basketball team at the 1936 Summer Olympics in Berlin. We are currently funding for Business start-up, business developments, business expansion, Project funding, working Capital and Christmas loan etc. Our funding sources specialise in creative solutions to meet your needs. with fast process and Instant Approval. Not all of the players were American Lithuanian, my Grandfather, Zenonas Puzinauskas was born in Lithuania and was part of both championship teams.